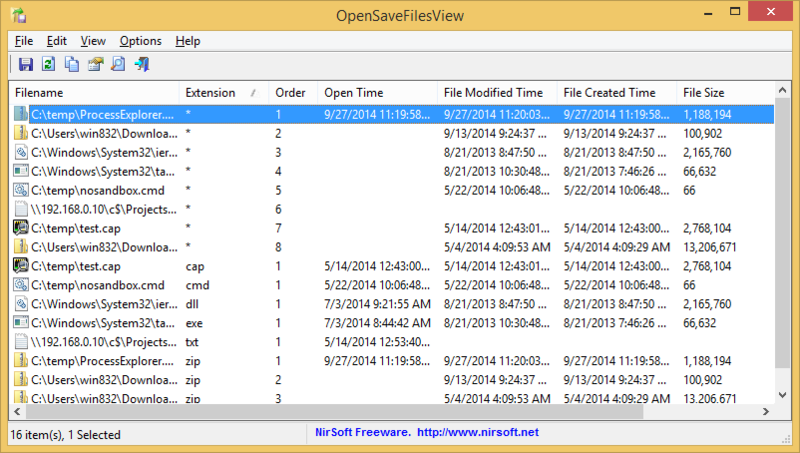 OpenSaveFilesView is a new tool that displays the list of files that you previously opened with the standard open/save dialog-box of Windows. For every file in the list, the following information is displayed: Filename, Extension, Order (The order that the files were opened for every file extension), Open Time (Available only for the last opened file of every file type), File Modified/Created Time, File Size, and File Attributes. OpenSaveFilesView works on any version of Windows, starting from Windows 2000 and up to Windows 8. Posted by NirSoft on October 4, 2014 at 1:35 am under Utilities Update.